PULLMAN, Wash. – If you were asked to change just one thing for two weeks in order to help the environment, would you? Today through Nov. 24, Washington State University faculty, staff and students are invited to participate in the “One Thing Challenge” and make one or more changes in their lives and habits to promote sustainability. /surveys/onething.asp to identify what they will do differently. Residence hall students wage a pre-Apple Cup behavior-changing competition against counterparts at the University of Washington. WSU has won four out of six years, based on the number of students signed up to participate. This year’s winner will be announced at Apple Cup in Pullman on Nov. 29. “There have been many hands-on activities this fall related to the 2014-15 common reading book, “Garbology: Our Dirty Love Affair with Trash,” by Pulitzer Prize-winning author Edward Humes,” said Karen Weathermon, common reading co-director. 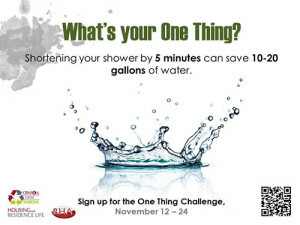 “We asked the Residence Life sustainability committee and other groups about expanding the one thing challenge, and they were excited. “The students and First-Year Focus faculty involved with the common reading have enjoyed digging in campus trash and learning about composting, for example,” she said. “We’re not all part of this year’s student competition, per se, but we are challenging the whole campus to think for these two weeks about sustainability. “We’re even considering expanding the competition with UW next year to include faculty, staff and non-residence hall students,” she said. 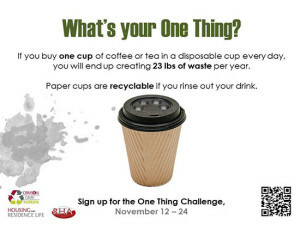 The online registration site allows participants to select from options that range from transportation to recycling and composting, sustainability to energy usage, and consumption to bulk buys and service projects. Students and the sustainability committee have created ads and videos for the competition and will have tables set up in dining halls with more information. Southside Café will have setups during lunch and dinner Nov. 12-14, Northside Café Nov. 15-17, and Hillside Café Nov. 18-20. For more information, a downloadable flyer for faculty and staff, and access to student flyers and two videos, visit http://commonreading.wsu.edu/one-thing-challenge/. Other WSU partners are Waste Management, Environmental Health and Safety, the Environmental Science Club and the ASWSU Sustainability Alliance.